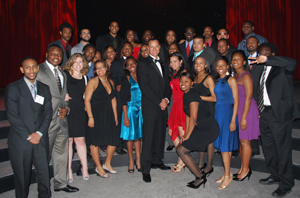 The National Society for Black Engineers (NSBE) has named the Clark School's Black Engineers Society (BES) chapter the 2008-2009 National Distinguished Chapter of the Year. The announcement was made at the annual NSBE conference in Las Vegas. This award is given to one NSBE chapter each year out of the 270 chapters across the country. To be considered for the national award the BES chapter had to win the Region 2 Distinguished Chapter of the Year Award as well. "We beat out powerful chapters from schools such as Georgia Institute of Technology and the University of Michigan to get this award and that speaks highly of the type of chapter we have and the support structure we have behind us," said Sidney Ngochi, BES chapter president. "Our members are a family of students that are closer than most and we are always excited to represent the University in such a positive light." As a result of the NSBE award, a number of members of the BES chapter will take part in an all-expenses-paid trip to San Diego later this year to ride a U.S. naval nuclear submarine, which will be documented by the Walt Disney Company. The chapter will also be featured in NSBE's magazine. This is the latest in a string of recent victories by student organizations related to the Clark School. See this press release for more information on other student competition victories. "Our members are a family of students that are closer than most and we are always excited to represent the University in such a positive light."